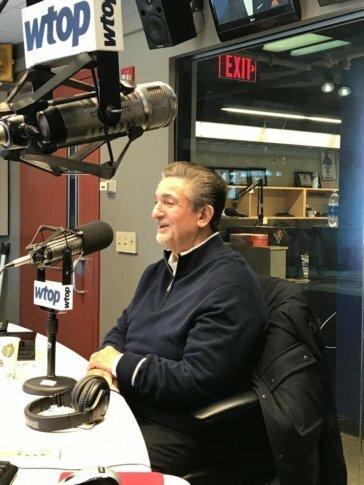 WASHINGTON — With the Capitals coming off a Stanley Cup title, ending D.C.’s championship drought, Monumental Sports CEO Ted Leonsis stopped by the WTOP studios Thursday morning to discuss a wide array of issues. He reflected fondly back to last summer’s title run and potential White House visit, laid out his expectations for the Wizards this season, and detailed his vision for legalized sports betting in the District. Leonsis brought his championship ring, as well as a piece of a meteorite carved into the shape of the Stanley Cup, which was a gift from a fan. Though the Caps are winless in their last seven games, they are still in a strong position to make the playoff and try to defend their Stanley Cup title. “Winning the Stanley Cup was one of the things to do on my list to bring the community together, and now we have to go and do it again,” Leonsis told WTOP. Leonsis also said that the White House has been in communication with the team about a potential visit to celebrate the title, but that nothing has been confirmed yet. The Wizards haven’t been nearly as successful of late. After a first-round playoff exit last year, they sit at 22-29 following Wednesday night’s win, 2.5 games behind the final playoff spot in the Eastern Conference. Leonsis said a fan recently asked him if the team would start rebuilding right away and mail in the rest of the season. Star point guard John Wall is out for the season after undergoing heel surgery. But Leonsis remains optimistic about the team’s chances at a postseason run this year. Despite an injury-plagued season that has seen the team underperform so far, Leonsis indicated that he had very specific goals for the Wizards this year, and that there could be repercussions if they aren’t met. “My expectations are that we are going to make the playoffs and improve on last year,” he said, though he did not expand upon what any further improvement would entail. When asked if he was happy with general manager Ernie Grunfeld’s performance, Leonsis indicated that depended on this year’s results. That contingency extended to head coach Scott Brooks as well. “In pro sports, every job is at risk every year. You really do use an offseason to take stock of what you do. But you do that by talking to the players, by talking to the agents, by talking to people within the organization, people at the league office. It’s not something that you make light of,” said Leonsis. Leonsis also ruled out dealing any of the team’s highly-paid stars before this year’s NBA Trade Deadline, specifically calling out John Wall, Bradley Beal and Otto Porter by name. “We’re not trading any of those players,” he said. Meanwhile, the Capital City Go-Go are in the midst of their inaugural season at the new Entertainment & Sports Arena in Southeast D.C., which is also the home to the Washington Mystics and serves at the Wizards practice court. Leonsis has also been one of the biggest proponents of legalized sports betting in America, which is being discussed among legislatures around the region. While he said he doesn’t gamble himself, he cited studies that 10 times as much money will be bet illegally ($60-$80 billion) this year than legally. “If we can move that revenue stream out of the shadows and into the light, it can be regulated, it can be monitored, it can be taxed, and it will become a very, very big business,” he said. Leonsis also tried to divorce the concept of sports betting from other casino gambling. “It won’t have the connotation of, oh, it’s gambling. Gambling is a game of chance. You’re rolling the dice. You’re buying a lottery ticket. That is a game of chance. Wall Street, when you’re buying a stock, you can do a lot of research and study, and I think that’s what it will look like in pro sports,” he said. Leonsis envisions sport betting not simply thriving online, but existing in brick and mortar locations right at the arena, and that legal sports betting will be online for the NBA and NHL playoffs this year. “I think you’ll see at our arena, but soon all arenas, that a partner company — an MGM, a DraftKings, a Caesar’s, a William Hill, the big, big players will create and open a sportsbook within your building,” he said. Leonsis also said the Arena Football League, in which he already owns two teams and a stake in the league, would serve as a testing ground.